Gemstones come in traditional colors. However, these “traditional” colors are usually not the only colors that exist for these gems. 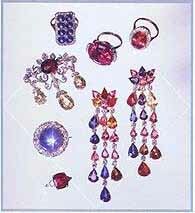 Often some of the most interesting colors are used in antique jewelry. A garnet – in any other color – is still a garnet – when it is red, it is understood. However, in the nineteenth century (during the reign of Alexander III of Russia 1881-1894) the green variety was discovered and was called ‘demantoid’ (demon-like) because they thought that the devil had changed the color. 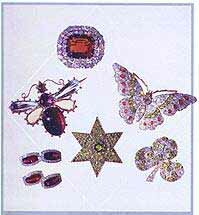 (The most popular myth for the origin of the name is ‘diamond like’, something quite far from actuality.) This green is due to calcium and iron. Today there are other green varieties as well as other reddish varieties such as the ‘hessonite’ shown here (upper left). The hessonite garnet contains calcium, the pyrope contains manganese and the almandite contains iron. A diamond is a diamond is a diamond – and is probably one of the most commonly used gems in jewelry manufacturing through the ages. However, as can be seen from the pieces shown here, the color can be dramatically different. You can have bright yellows to black to green, blue and even pink and red. The colors of diamonds are seemingly endless. When nitrogen is present, you get a yellow diamond; and when you have boron, you get a blue diamond. Pearls – coral – turquoise – topoz – spinel – shown in the picture. 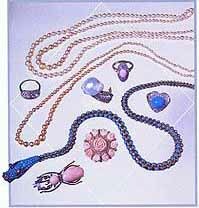 There are numerous other materials which man has used throughout time; these include turquoise used in both the snake necklace (English circa 1845) and the diamond cluster ring (English 1880). Turquoise was popular not only in Europe (usually Persian in origin) but also in the United States with the ever increasing interest in Native American and Hispanic cultures – especially in the Southwest. The seas have also provided us with materials which have been widely used, and still are to this day. These include, among others, coral, which is the skeletal remains of a sea animal colony built up from calcite with a color that can vary from light to dark orange to red. The example shown here is a coral and diamond brooch carved as a rose (English circa 1885). Another example is the scarab brooch, which comes from Russia at the end of the 19th century. The pearl also comes in a variety of colors and shapes. 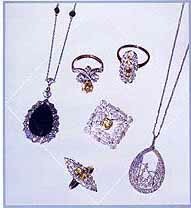 This is shown by the two necklaces of golden pearls pictured bottom right. The different colors of pearls are caused by impurities that can exist in the water. The shape of the pearl itself is also not always uniform, and sometimes a piece of jewelry is created around this baroque shape. An example of this is the snail brooch (English circa 1950). The other type of pearl shown in this picture is the ‘pink pearl’ or ‘conch pearl’. These pearls come from the conch shell mollusk around the Florida Keys, producing pearls like the ones used in the marquise shaped diamond cluster ring (English circa 1890). Topaz, or precious topaz as it is sometimes known, is the color of sherry wine and was widely used during the Victorian period and earlier. It also comes, rarely, in a rich red color (diamond cluster ring). Beryl: aquamarine and emerald are two varieties of this stone. Both are beryl, as is a wonderful pink variety called ‘Morganite’. Therefore, a ruby is to a sapphire as an emerald is to an aquamarine!